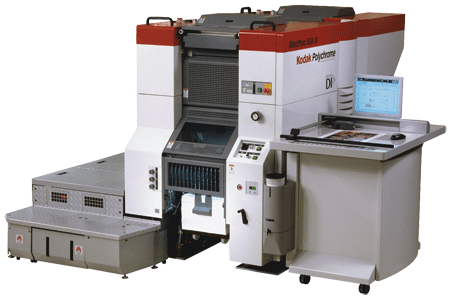 We offer high quality offset printing on our state of the art DI printing press. Because we image directly from a computer file to the press, we are able to print with excellent registation starting with the first sheet. Our DI press also use aqualess inks --- we don't need fountain solution when printing which means that the image is sharp and we have less dot gain than standard offset presses. We are able to print 300 line screen if needed. This will allow you to see maximum details on your images. In addition to normal paper printing, we are also able to print on adhesive vinyl, magnetic stocks, and card stock up to 24pt. To see a sample of 300 line screen printing, email sales@altimages.com and request our "Equipment and Services Guide".